Exactly what does a day in the life of a camper look like? It is much easier to experience than to explain, but let’s take a peek into the schedule of a normal day at camp and see what we can see. 7:00 - 7:30	Camper Prayer Time: A voluntary 15-minute prayer time with a Wilds Program Staff member for God to work in the hearts of their teen friends this week. 7:00 - 8:10	Clean Up/Cool Beans: Cabin Clean-up is a tradition. At lunchtime the inspectors reveal who did well or not so well. The girls often do better than the guys. For the diligent cleaners, Cool Beans is open for morning coffee and fellowship. 7:50 - 7:55	Flag Raising: We are so very thankful for the freedom we have in America to worship as we do. Honoring our flag and country is a must at camp. 8:00 - 8:45	Breakfast: Breakfast is a time to fill up and wake up. Lots of protein can make a difference so bring on the eggs, bacon, sausage, milk, yogurt, etc. 8:45 - 9:00	Sponsor Prayer Meeting: Sponsors are the pastors and wives, youth pastors and wives, and any other adults who bring the campers and enjoy a week of camp while experiencing exactly what the campers are experiencing. The unity, fun, and fellowship this creates impacts the entire year of ministry. 9:00 - 10:00	Chapel: This is one of the main reasons we are at camp. Morning chapels are a more in-depth study time as the speakers walk through a pre-chosen book of the Bible (Philippians, 2 Timothy, Ephesians 6, Romans 12, to name a few) or character studies (Joseph, David, Daniel). Our goal is to create a thirst that results in a constant appetite for the Word of God each and every morning. 10:00 -	10:30	God & I Time: Quiet Time. Devotions. God & I Time (a phrase coined Dr. Ken Hay, the founder of The Wilds) is a part of every camp we offer. Thirty minutes is set aside each day for campers to complete their study guide that correlates with the chapel study each day. 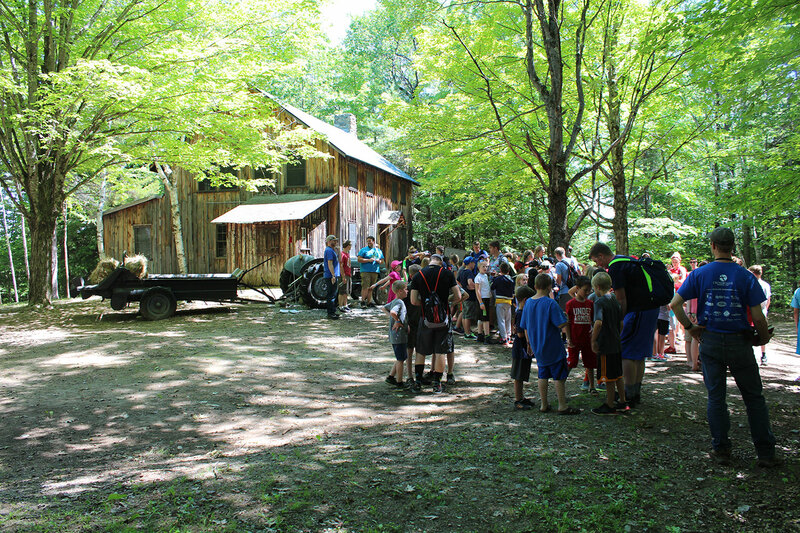 Six-week studies over the same material are available for campers to purchase in the General Store so that they can continue at home the joyful habit they had began at camp. 10:30 - 11:00	God & I Time Follow-Up: For example, Philippians 2 was taught in both chapel and God & I Time, so now we schedule a half hour to talk through and apply what was learned from those two study times in a small cabin group setting. 11:00 - 11:45	Christian Life Seminar: CLS—Christian Life Seminar is our second opportunity to preach the Word of God to the campers. CLS deals with current, real-life issues that the campers face on a daily basis such as peer pressure, Internet addictions, bitterness, rebellion in the home, dating relationships, entertainment issues, etc. 12:00 - 12:45	Lunch: There is nothing scarier than a hungry teenager. Lunch time is always fun with lots of food (a menu made for a teen) and a chain of cabin cheers jockeying for the most popular in the dining hall. Hold your ears—it gets pretty loud. 1:00 - 3:00	Mystery Mansion Activity Time: Unique to TWNE is our very own Mystery Mansion located above Orchard Hill. It is not only the home of our Laser Tag Farmstead, but the two-story old, old farmhouse hosts an array of unique activities such as live CLUE, The Smithgamian Institute, and The Missing Piscataquog Indian Treasure. 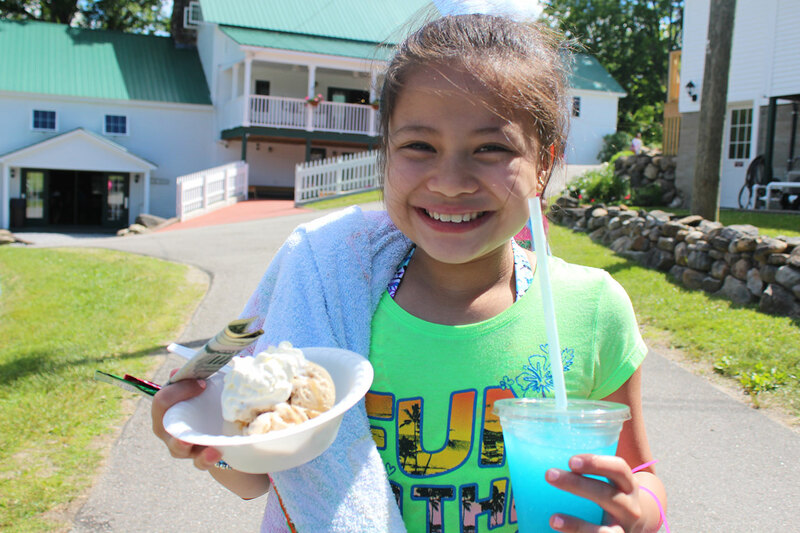 3:00 - 5:00	Sweet Shoppe/Cool Beans/General Store: No teenager or junior camper can live on only three meals a day. They need something sweet! They need something salty! They need something to drink—hot or cold! Whatever they think they need, it can be found in Cool Beans or the Sweet Shoppe. And once that thirst or hunger is satisfied, many campers enjoy a little time shopping at the General Store to find a TWNE hoodie to stay warm, some great Bible studies to get to know the Lord better, some Christian music to take home, and possibly even a gift for that little brother that they miss so much. 3:00 - 5:30	Free Time: What is there to do during freetime? Well, there is Sand Volleyball, 9-Square-in-the-Air, Dodgeball Cage, Fenway Park, Disc Golf, Basketball, Pool, Game Room, Carpet Ball, Foosball, Swimming Hole, Horseshoes, Uno, and Ping-Pong just to name a few. Also, sign up for Laser Tag, Bazooka Ball, or a thrilling ride down the 940 foot Zipline! There are so many freetime activities, you will not have enough free time to enjoy them all. 6:00 - 6:45	Supper: Time to eat again. The food is good to the taste, adequate in quantity, and cheerfully served by smiling waitresses in a family-style way. And while the meal continues, the cabin cheers continue to escalate in volume, intensity, and craziness. 7:00 - 8:00	Evening Youth Rally: Ultimately, this is why we have camp. The Word of God is personally studied each day in God & I Time, discussed in small cabin groups during follow-up, and preached three times a day including our morning chapel, Christian Life Seminar, and evening youth rally. Our mission is to give the Truth of God, with the love of God, so that lives are changed to the glory of God. 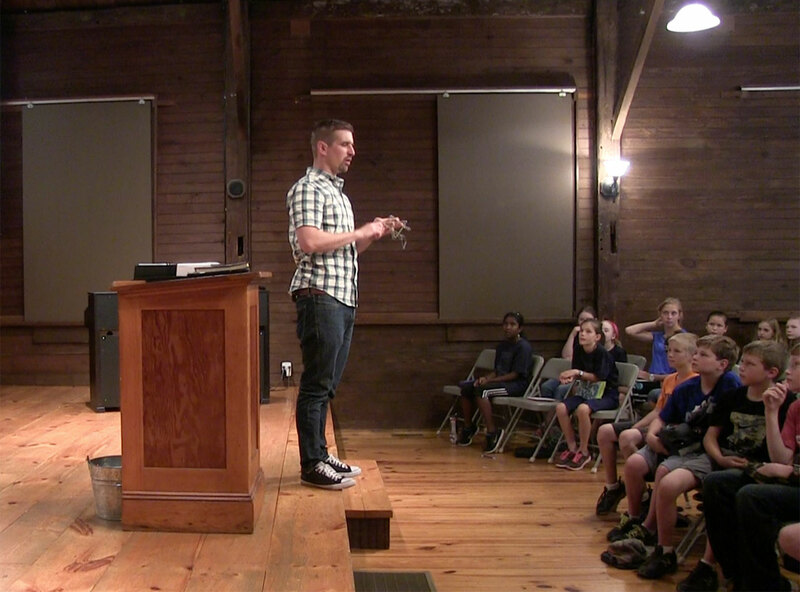 We choose speakers who are gifted at communicating the truths of Scripture and applying them in a way that brings serious and lasting change in the hearts of the campers. For those who respond at an invitation at the end of a evening service, our staff is trained and ready to counsel each camper one-on-one to clarify and encourage them in their decision. 8:00 - 8:45	Cool Beans/General Store/Sweet Shoppe: If you did not get full at supper, it is time for something sweet or salty again. 9:00 - 10:00	“TWNE Funtime”: Get ready to laugh! Well, at least get ready for some good groans. The Wilds Funtime has been a classic since the inception of The Wilds in NC almost 50 years ago. 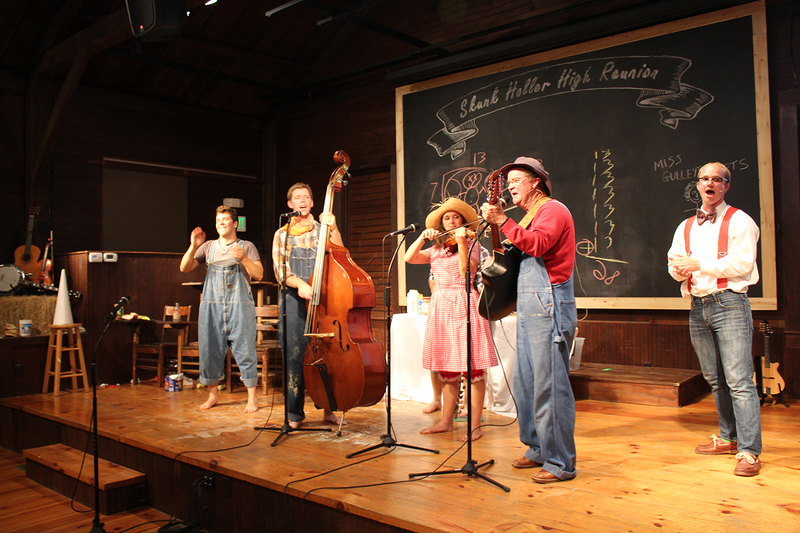 One hour of humorous music, silly skits, and quite messy slapstick routines fill our Meeting House with laughter like you have never experienced before. 10:00 - 10:15	Prepare to Slumber! : It’s been a long day and sleep (the counselors hope) is just around the corner. 10:15- 10:25	Cabin Devotions: Meditating on a simple yet eternal truth from God’s Word is a great way to fall asleep after a long day of wonderful experiences.